Topics: Wooden Fence, Wooden Designs, Metal Fence Posts, Build A Wood Fence, and Reviews And Raves. 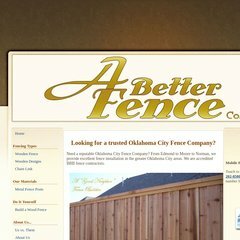 a-better-fence-constru.. Building a Wood Fence | How to Build Privacy Fence, How to Install ..
a-better-fence-constru.. Cheap Fence Panels and Discount Privacy Fence vs. quality Cedar .. The site has about 154 users daily, viewing on average 1.70 pages each. exterior-home-improvem.. Exterior Home Improvements your home is longing for. ns1.sitesell.com, and ns2.sitesell.com are its DNS Nameservers. Sitesell Inc (Quebec, Montreal) is the location of the Apache server. Its local IP address is 66.43.61.159.